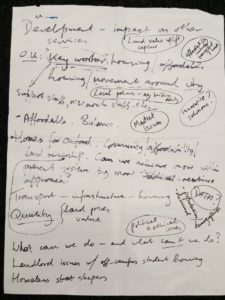 The first meeting of our new Housing Policy Group happened on 3 February. After the usual introductions the Group got down to setting out the issues it might work on. The flipchart looked like this after everyone in turn had put in their contribution. Analysing all this it seems that at national level there are issues about the National Planning Policy Framework (NPPF) and the operation of the planning system; capturing the uplift in land values from development to fund the provision of infrastructure; and how the housing market operates and the effect of government policies such as help-to-buy. At regional/county level everyone agreed that housing development should not be considered in isolation from employment, transport and other infrastructure. They recognised that the current planning systems struggle to deliver this and wondered how local government reorganisation and devolution of powers might affect this. They would like to contribute to the Local Plans which the city and districts are preparing. At the local level issues of house prices, affordability, key worker housing and the general shortfall in housing provision are major concerns. Employers have serious problems attracting and retaining key workers. Student accommodation is also an issue. The quality of rented accommodation for students outside halls of residence can be poor and some landlords are unwilling to make improvements. Innovative solutions are needed. A visible increase in the number of rough sleepers was a matter of concern: homelessness is a symptom of a failure of the system. The Group realised they would need to become familiar with sources of data which could help understand these issues, and establish contact with other groups working on housing problems. 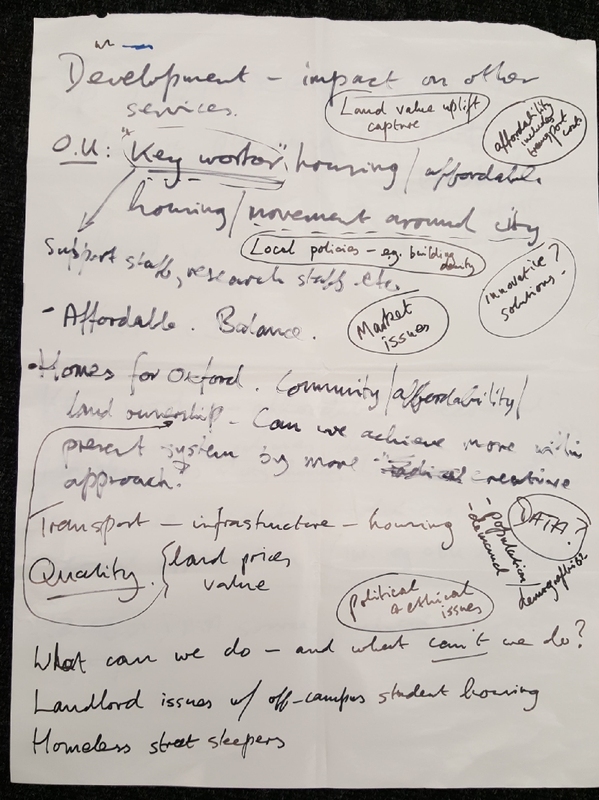 It’s still very early days for the Housing Policy group, and like our other working groups it will only be able to work on the things that its volunteer members have time and enthusiasm to work on. At the next meeting they hope to set themselves a programme of work drawn from the issues they drew out of this first meeting.